470 pages, Illustrated, 7 1/2" x 9 3/7"
This title is a new edition of Years of Russia and the USSR which charts Russian history from the reign of Alexander II through to the eventual fall of Communism nd the break up of the Soviet Union. It examines the political, social and economic impact of Nicholas II's reign, the First World War and the subsequent revolution. It then looks at Bolshevik and Stalinist Russia before going on to discuss Khrushchev's policy of de-Stalinisation and the years of stagnation and reform. 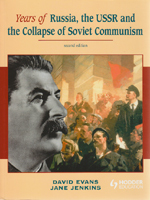 This new edition has been updated to ensure full support for the revised History A level specifications and expanded to include complete coverage of the collapse of Soviet Communism. It also includes a new section of advice on answering synoptic questions.